Udforsk Cannes, Antibes og St. Paul de Vence med en lille gruppe på denne 4,5-timers tur fra Nice. Med din guide i spidsen, ramt højdepunkterne og landemærkerne for hver destination. Din lille gruppe sikrer en intim atmosfære og personlig opmærksomhed fra din guide. Hotel afhentning og drop-off i Nice inkluderet. Didn't get to see much of Cannes due to some activities happening that evening. But otherwise the tour was exactly as advertised. we really enjoyed Antibes and St-Paul-de-Vence. Our driver was full of information about the area and great with the car. Had a lovely time. Unfortunately the rain started when we got into the van at Nice. the van was full so not so comfortable. The driver effectively dumped us at Cannes with few instructions. We were left to wander for an hour. Antibes was a similar experience, though would have been a better place to explore in better weather, and if markets or the Picasso museum had been open. We were all wet and cold and back at the pick up location 15 minutes early, though the van was not there until the appointed time. St Paul de Vence was what we all wanted to see. The driver did not stop anywhere for photos on the way up, and the windows were wet so impossible to get any good pictures of this beautiful walled city. We arrived at 5.45 pm. All the shops shut at 6pm. Overall a very disappointing afternoon. I have always enjoyed Viator tours but this one was not a favorite. Antonio, our guide was pleasant and knowledgeable but we were stuck in the third row of the van with the air conditioning fan blowing behind us. We couldn't hear what he was saying. Also, his driving was very aggressive making the trip unenjoyable. The stops weren't long enough so we felt rushed and couldn't relax and enjoy the experience. Wonderful trip we really enjoyed our selves. Our guide was a great driver, however the combo of driving and talking did not work the 3 people in the rear seat of the van could not hear. We recommend audio sets for driver and passengers as most tour groups use. We did have about 45-50 min in each stop, but needed to search out a info tourist office for maos. Salvador was so knowledgeable, friendly and articulate, that we were gobsmacked by his knowledge of Cote D'azure in general. He was flexible and allowed us a little longer in Antibes. A great guide and tour. 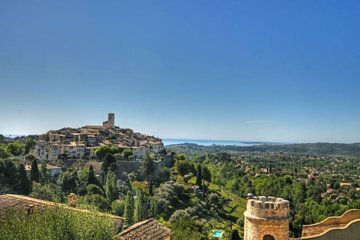 Loved St Paul de Vence. Such a unique medieval village. To be preserved the way it is makes it very special. Great views over the valley. Local parking inspectors are tough though. Unfortunately the famous Cannes steps were blocked off with construction fencing so we were not able to see as much as we would have liked.